The LEGO Star Wars Collectible Display Set 5 is an exclusive San Diego Comic-Con International Star Wars set released for one day during the convention in 2009. 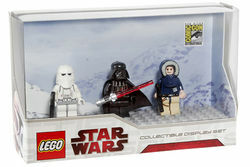 It includes three minifigures: a Snowtrooper with blaster, Darth Vader with a chrome red lightsaber and Han Solo in Hoth clothing with a blaster. This was the display set for the convention on Friday (July 24, 2009). Facts about "LEGO Star Wars Collectible Display Set 5"
This page was last edited on 18 August 2017, at 00:39.